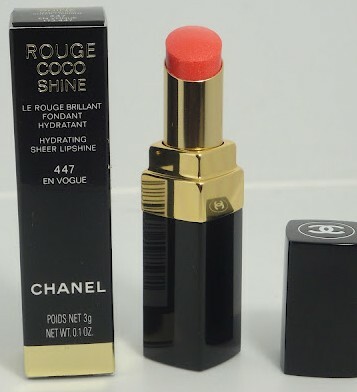 CHANEL ROUGE COCO SHINE HYDRATING SHEER LIPSHINE in #447 EN VOGUE is part of the Chanel Summer 2012 collection. Read more about the whole collection here. En Vogue is a bright coral lipstick that is quite sheer. When applied on the lips it almost looks more pink than coral though. So take note if you were wanting a true coral lipstick you might want to pass on this one because this Rouge Coco shine is definitely not. I think that is why I love this one so much. It gives the warmth of a coral color but applies more as a sheer lightly colored watermelon pink. Typically Rouge Coco shines give several hours of wear time before having to be reapplied and that is true with this one. As I always state in my reviews of these lipsticks I love how smoothly they apply, how non-sticky they are and how they are so much like a really heavily pigmented gloss. I prefer these over regular lipsticks and I don't mind the price either. Currently the Rouge Coco shine lipstick retails at $32.50 for .1 oz.